FLORIDA BLUEBERRY GROWERS had a tough season, coming into the marketplace late, with about 30 percent of their usual crop. Some harvest workers moved north, which left many growers turning to offer u-pick to harvest their crop or leave berries on the bushes. “We are hoping the USDA [U.S. Department of Agriculture] will declare a disaster [ … ],” says Bill Braswell, a Florida Blueberry Growers Association board member who grows and markets blueberries. “They’ll be working on it all summer … I feel pretty confident they will give us a disaster declaration.” The determination is made on a county-by-county basis. “The 2016 season has growers crying the blues, with few options for processing or other value-added activities,” observes Mary Beth Henry, a Polk County small farms extension agent with University of Florida/Institute of Food and Agricultural Sciences. Florida traditionally markets fresh blueberries in the second half of March and April, when it can command higher prices. But if it misses that window, it faces competition from Georgia, North Carolina, and other areas. That drives down prices. “If you miss it [the marketing window], you just missed it,” Rowe explains. The USDA’s daily movement report shows there were 335 trucks of blueberries shipped throughout Florida this year, compared to 619 last year. Organic blueberry shipments were down also, from 13 shipments last year to 10 this year. In the May 27 report, each truck represents 40,000 pounds. An unseasonably warm winter and an El Niño weather pattern — followed by cloudy and cooler weather during fruit set and development — delayed the crop. This year, blueberries just didn’t get enough chill hours to produce as they should have. They are also looking to improve crop forecasting, which starts with more accurately accessing blueberry acreage in the state. There are currently between 5,000 and 8,000 acres statewide planted in blueberries, Calfee estimates. Growers are consulting Florida Commissioner of Agriculture Adam Putnam in hopes of getting grant money for an acreage survey. “If we know what we’re going to get, and when we’re going to get it, we can always get a better price for it,” Calfee states. In the midst of these challenges, growers got creative about how to deal with the unpicked crop. Some offered giveaways or donated u-picked fruit to charity. Polk’s 4-H organization scheduled a Youth Service Day from 8:30 a.m. to 11:30 a.m. on June 11 at Shady Oak Farm in Lakeland to pick fruit for local food banks, including the Bartow Church Service Center and Leland Family Ministries. Braswell — who uses pickers at Polkdale Farms under the federal government’s H2A guest worker program — also brought in 200 Polk County inmates to pick. Braswell points out they picked about 7,000 pounds donated to 14 different charities; some were given to the jail to help offset produce costs. 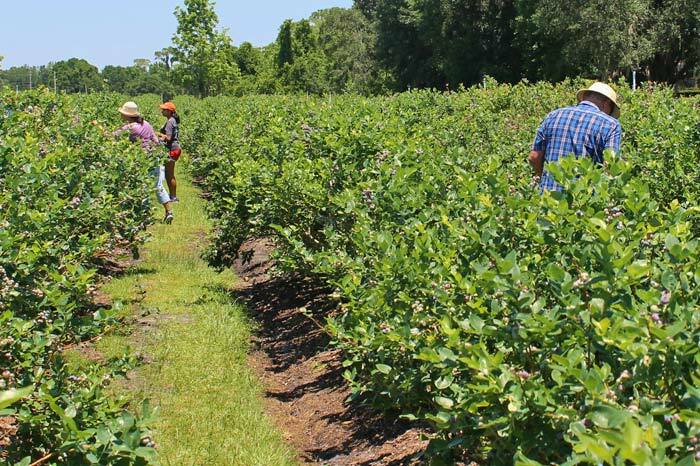 While many commercial blueberry farms turned to u-pick (a form of agritourism, which invites the general public to experience a recreational day at the farm while picking the fresh fruit), the Florida Legislature passed an agritourism bill. Supporters of the legislation say that it will be conducive for growers who set out to offer farm tours, farm dinners, and other tourist-related activities as a way to offset the high costs of production. “The new agritourism law helps farmers and ranchers in their efforts to reconnect Floridians and visitors to the land and food production,” says Aaron Keller, Putnam’s press secretary. Reaction has been favorable. “I am pleased to see government responding to the needs of growers with common-sense changes in law … With a record 105 million visitors to Florida last year, and the ever-expanding interest in knowing where our food comes from, Polk County is well positioned to benefit from these trends,” Henry says. Farmers interested in learning more about their agritourism options can contact Henry for more information. There are some other changes that may help in the future: Coordinated marketing, running farms as businesses instead of hobbies, and building loyalty and unity in the industry and community. Braswell is of the opinion that the growers would benefit from “marketing with companies that have skin in the game,” referring to those who grow and market. Examples are Clear Springs (which Braswell manages), Naturipe, Wishnatzki Farms, and Dole, who all have more at stake in the market price. Because of losses this season, there may be some tightening of the proverbial belt for farms in the industry. Calfee expects it to effect expansion plans in the short-term — or decisions to expand, re-mulch fields or buy new equipment, for example.